We open our story with April reporting from the Japanese Embassy about their latest historical artifact exhibit — the Sword of Yurikawa. But this is not just any sword — this sword was once owned by Splinter’s ninja master. Apparently, the katana has amazing and powerful attributes. Splinter fears that if it were to fall in to the wrong hands, dire consequences would ensue. He orders the Turtles to go to the museum to guard the sword. Meanwhile, Krang’s crazy scheme this week is to blow up the Tri-State Bridge just as a convoy of trucks carrying a “rare form of toxic waste” passes overhead. The toxic waste will spill into the harbor and upon contact with the sludge at the bottom of the river, create a race of MUD MUTANTS. Then, Krang will use his Mindbender Ray to make the Mud Mutants obey his every command. Meanwhile, Shredder learns about the ancient Sword of Yurikawa, now on exhibit at the Japanese Embassy, leaves the Technodrome and heads for the surface. He believes that if he possessed that sword there would be no need to blow up the bridge. 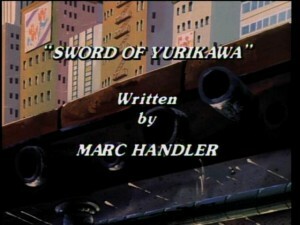 But Shredder is not the only one in this story who covets the Sword of Yurikawa. It seems that Lafayette Le Drone, an international weapons fancier, wants to add the sword to his collection. Prior to the end of the first act, the Sword of Yurikawa is stolen by an “unknown” masked ninja and replaced with a bogus one which in turn is stolen by another masked ninja- attired Lafeyette Le Drone and replaced with a bogus one — which in turn is stolen by masked ninja-attired Shredder and not replaced at all. By the time that the Turtles arrive to guard the sword, after making a detour for a pizza respite, the sword is gone. Embarrased by their sense of priorities, they vow to find the stoen sword rather than return to the lair and inform Splinter of their failure. But before the TMNT can begin their search, they are confronted by masked Ninja #1 and his flaming sword, and are summarily defeated. Back at the Technodrome, Shredder learns that he does not possess the Sword of Yurikawa and returns to the surface to find it. Krang is concerned that there is little time left to rig the bridge with explosives, but Shredder asssures him that the sword will be more effective. Thanks to the security camera video, the Turtles learn of Le Drone’s identity and set out for his mansion in an effort to reclaim the sword. Unbeknownst to them, they are being followed by Shredder, Bebop and Rocksteady. After a minor squirmish with Le Drone, the Turtles realize that he does not have the “real” sword of Yurikawa and, once again, set out in search of it. No sooner do they leave, then Shredder arrives and convinces Le Drone that it would be in his best interest to join forces with the nasty ninja. Shredder promises that once he uses it for his own purposes, Le Drone can add it to to his collection. And no sooner do the Turtles take possession of the real Sword of Yurikawa (thanks to the original Masked Ninja who stole it from the Japanese Embassy) then Shredder is able to liberate it from them. At the Tri-State Bridge, with the Turtles trussed up in ropes and hanging from a suspension cable, Shredder awaits the convoy of trucks hauling the “rare form of toxic waste” and boasting about his new found destructive powers. But Shred-head’s boasting is cut short, when in his attempt to use the power of the sword, it turns on him. Suddenly, the Masked Ninja arrives, frees the Turtles, and reveals himself to be none other than Splinter. Foiled again, Shredder retreats and the convoy safely passes over the bridge.